AMS Performance VW Golf R/GTI MK7 Carbon Fiber Intake System – Equilibrium Tuning, Inc. The AMS Performance VW Golf R MKVII Carbon Fiber Cold Air Intake Upgrade was designed to draw a higher volume of cold air into the stock turbocharger. With this intake installed, bulky air filter boxes are replaced with our carbon fiber tubing and dry media filter. This eliminates clutter within the engine bay while drawing cold air from outside. The MK7 Golf R Cold Air Intake Kit is a vast improvement over the stock intake system and supports power levels up to 600HP! We selected a motorsports grade carbon fiber that is both hand-laid and high temperature resistant. Other options on the market use the typical gloss clear coated carbon fiber prone to discoloration and cracking. Our AMS Golf R MKVII Intake Kit uses 3-layers of 1mm twill weave prepreg carbon fiber capable of sustaining a 240C temperature threshold while maintaining structural integrity and aesthetic appearance with no worry of fading or yellowing over time. 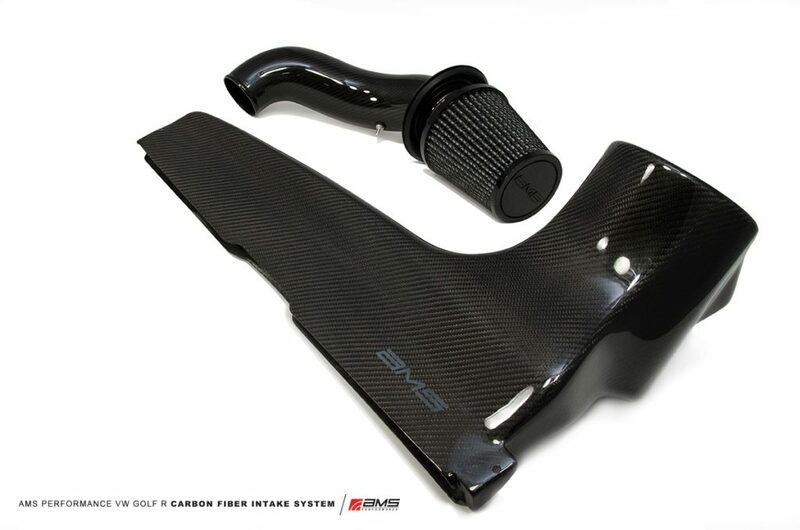 The AMS Carbon intake also eliminates the engine bay vents that are found on the factory intake. These vents allow the OEM car to pull in hot engine bay air for startup and fuel consumption requirements to the detriment of performance. By opening up the entire front grill and eliminating these warm air vents, 100% of the airflow is cold air being brought in from the front grill of the car. The OEM manufacturer spends a lot of time reducing turbo noise at the expense of horsepower. By allowing the turbo to ingest all the cold air it needs, the AMS VW Golf R MKVII Carbon Fiber Cold Air Intake upgrade boosts power significantly. The use of carbon fiber composites allowed AMS’ Snailworks Engineers greater design freedom to enhance performance and aesthetics for your Golf R. The new large AMS front duct was specifically designed to distribute airflow evenly over the entire circumference of the intake filter. This means greater distribution of cold airflow across the filter resulting in lower pressure drops and a longer filter life between cleanings. In addition, it allows you to hear the turbo spool up, something you as an automotive enthusiast can truly appreciate. The use of carbon fiber allowed a consistently tapered tube and large gradual bend radii, adapting the 3.5″ outlet filter to a 3″ inlet size with no sign of restriction. The tube then simply integrates to your factory turbo elbow with the provided 3″ to 2.75″ silicone coupler. This design allows for an easy upgrade in the near future to a larger turbo elbow or the AMS Performance Turbo Upgrade Kit with only a simple 3″ coupler. AMS designs all of our components with our customers’ end goal as our guide. This intake, the AMS Intercooler, and AMS downpipe are all part of a complete system that will work seamlessly with the AMS Turbo kit without having to buy parts twice. You can expect an easy install without cutting, trimming or taking off your grill. It can be installed with basic hand tools in minutes! Couple that with a purpose built, reusable synthetic high-flow dry media filter, you’ll no longer have to purchase cheap factory paper filters down the road. The “Dry Media” filter means just that, no more messy oiling of your filter. Just one more reason why our intake is the best option on the market. 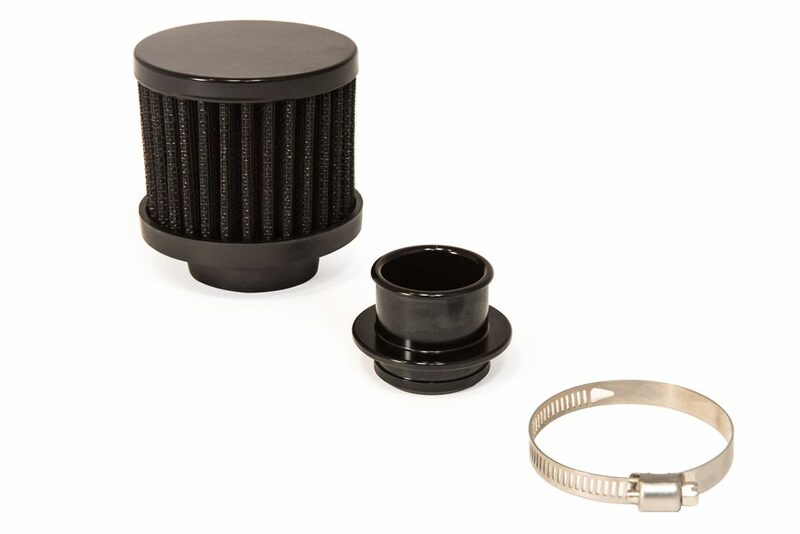 The AMS MK7 Golf R synthetic media filter was designed and manufactured specifically to fit this application. The filter is a washable, reusable synthetic media filter (no oil) that was developed for automotive use. The filter size and configuration was fine tuned to ensure that it will still provide all the necessary air for any MK7 Golf R, including upgraded turbo cars, without any substantial restriction or compromise in filter efficiency. Also, for vehicles equipped with Secondary Air Injection, AMS offers an optional SAI filter. AMS’ Secondary Air Injection Kit for SAI equipped Golf Rs. Be the VW MKVII Golf R driver to beat! 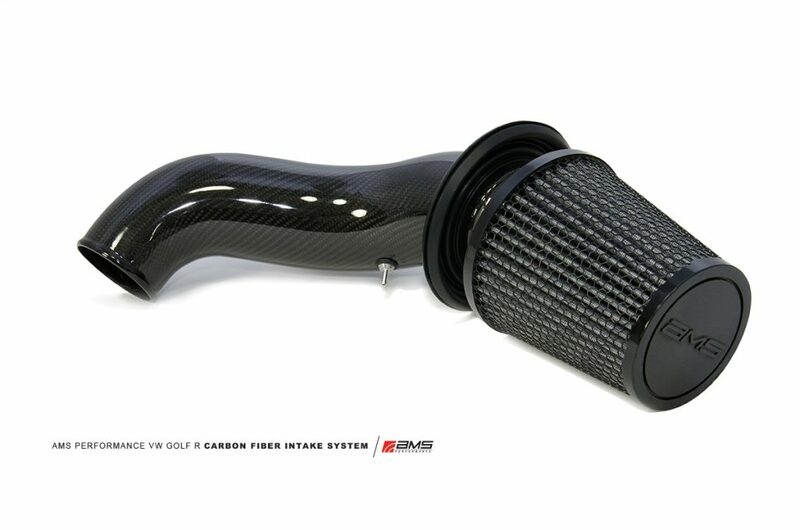 Order the AMS Performance Golf R Carbon Fiber Intake Upgrade today! Effective to over 600 HP! AMS Performance 2015+ VW Golf R MK7 Carbon Fiber Intake System Install Instructions can be downloaded here.